Whenever there's a book that I really like, such as Pillars of the Earth, I'm always ecstatic to find out that there's a sequel. 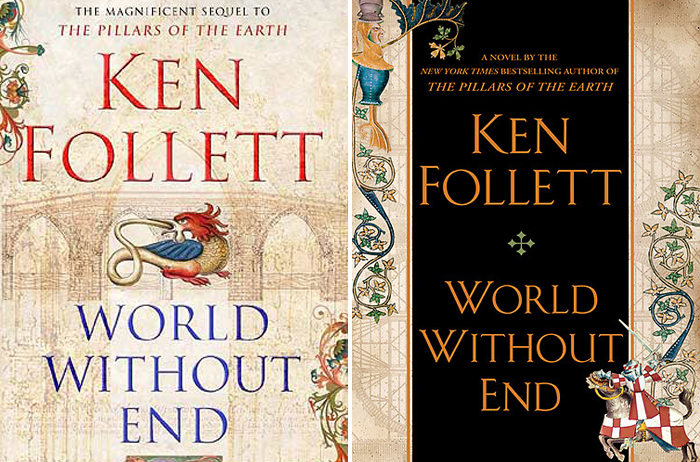 The obvious choice for my next read was World Without End, Ken Follett's sequel to Pillars. The novel takes place 200 years later, in the same town, Kingsbridge, which we were introduced to in the first book. We meet relatives of the original characters who are the protagonists of this novel. The plot lines are more or less the same as Pillars (see review here). The one curve ball, that I absolutely loved, was the introduction of the Plague. It really made for an interesting turn of events. What I particularly like about Ken Follett's writing is that he continually represents strong female characters. However, I wasn't thrilled that Caris, the female lead, had to choose between her career and love. I know that we're talking about the 1300's here, but I would have liked if Caris could have been able to have it all. I hate the idea that a strong, independent woman, has to be alone in life in order to succeed. It shouldn't be an all or nothing choice - I think she could have maintained those characteristics and got the guy. I'm sad that I'm now back in reality and not living the daily life of someone in the 14th century. If anyone has anymore Game of Thrones, Pillars of the Earth recommendations,send them my way. I'm clearly a history buff.